Some flooring materials naturally feel cold on bare feet. However, cold floors are often have a lack of insulation and air leaks. Nobody likes cold feet when they get up in the morning. What a shocker! Nobody wants achy feet either. More importantly, we big people tend to forget our little ones when we set the temperature for the house. Did you know it can be 5 degrees or more colder near the floor than it is around your head? Would you like to stay in a place that’s 63 degrees without warm clothing very long? Ask your youngsters! Shout it loud! My energy bills are already too high, so I’ll keep the heat at 68 degrees or lower. That’s what’s recommended, right? Did you know you could keep your house at 72 degrees and everyone would be a lot more comfortable? We’ll talk more about how in future blog posts. For now, let’s try to understand the problem. Flooring Materials. The first thing that comes to mind about cold floors is the type of flooring installed. Tile will be colder than wood or carpet every time. Concrete, clay, or other masonry does a great job of holding heat, even if it’s colder than we’d like! Typical solutions include putting rugs on the floor. More radical folks change the flooring! Some include floor heating in tiles. I don’t know about you, but I paid good money for my floor, thank you, so what else you got? What other ideas are there? 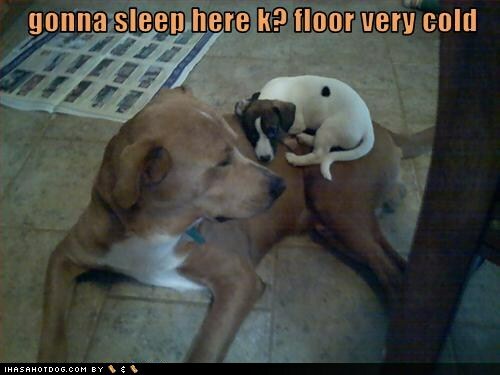 Floor Insulation. Floors can be cold because they are cooled from underneath. Slabs are in constant contact with the ground, which is around 64 degrees. For slabs, the solution is to install flooring on rigid insulation. My friends with crawlspaces may have the coldest floors of all—especially up North. Frequently, crawlspace floors are uninsulated. So insulate them! Unfortunately, it’s not installed right, so it doesn’t work very well. Most people use batts. Gravity takes over and they fall out. How? Wood dries and houses move. Wire supports that hold today sproing out of position given a half a chance. What’s worse, is that the insulation is squashed or shoved into place—resulting in a much lower effective insulation level. I’ve seen plenty of R-19 batts in floors I’ve had to rate as R-5 or less. You might find it easier to enclose the crawlspace and insulate the foundation walls instead. Unfinished basements tend to be warmer than crawlspaces in Winter, but the crawlspace solutions work for them too. Air Movement. Air moves for a variety of reasons. We’ll talk about central heating & air systems separately, in about a minute. The first type of air movement is convection. Warm air from the ceiling cools at exterior walls and falls to the floor, moving the cold air already on the floor. Air infiltration through all the cracks in the walls, floors, and ceilings will also do the trick. Differences in air temperature or pressure makes air move through the holes. If more holes are in the floor than the ceiling, the air will be colder along the floor in the winter. Poor Air Circulation. Keep your flooring. If you need to, insulate your floors. By all means, air seal the house—especially if you live in areas that get hot or cold. In newer houses, all that may be built in already. So what’s the problem? It’s the heating and cooling system, most likely poorly installed ductwork! A properly designed system will keep the air temperature within 3-5 degrees—floor to ceiling—including multi-story houses. Unfortunately, duct design doesn’t seem to be part of most HVAC contractor’s job description. When you ask about Manual D, they’ll either stare at you like a deer in headlights or promptly tell you Manual D doesn’t work. (ACCA Manual D is the duct design standard). I’m okay with an HVAC contractor telling me they don’t use Manual D to design their ductwork as long as they can tell me what principles they need to follow and deliver a comparable result—an air distribution system that keeps everyone comfortable. Better Air Circulation. Here’s what has to happen. Room-by-room air delivery has to be designed in terms of velocity, direction, and volume. The air delivered to the room needs to be thrown across the room fast enough to nearly reach the other side. The cooler air in the room has to be mixed (not circulated) to provide and even temperature, so direction is important. Besides, the last thing most people want is the air blowing down on the them. Of course, enough air must be delivered to heat and cool the room—it’s volume. Unfortunately, many HVAC contractors use rules of thumb that used to work years ago to size ductwork for a room. In addition, they use a $3.50 register rather and $35.00 one. The expensive ones are engineered for performance. The cheaper ones are stamped out just to make a cover. Finally, even though the building code requires the use of ACCA Manual J: Equipment Sizing to determine the heating and cooling load for the house, most still use less than valid methods for sizing equipment. In fact, in practice, systems are 2-3 times bigger than they need to be. Is it any wonder we’re uncomfortable? Bop the Builder said it best when I was at Legoworld California over Thanksgiving 2010. “Plan it, build it, use it”. Unfortunately, the scarecrow didn’t think planning was important, even for something as simple as a bird house. It fell apart immediately. If the ductwork isn’t planned, a comfort system immediately does not work right! The answer to cold floors just might be properly designing the air distribution system! I found this interesting on-line article about designing heating & cooling systems. Just why is it so hard to get a planned system? Speaking of cold and winter, Dry Indoor Air is next! How do you get static electricity?! !